Seven children have suffered “potentially serious” injuries after a fairground slide collapsed during a fireworks event. Woking Park in Surrey was evacuated after a giant inflatable slide collapsed at the fairground earlier. The children were treated at the scene and have been taken to major trauma centres in what the ambulance service described as a “significant incident”. The site was evacuated for an air ambulance to land. 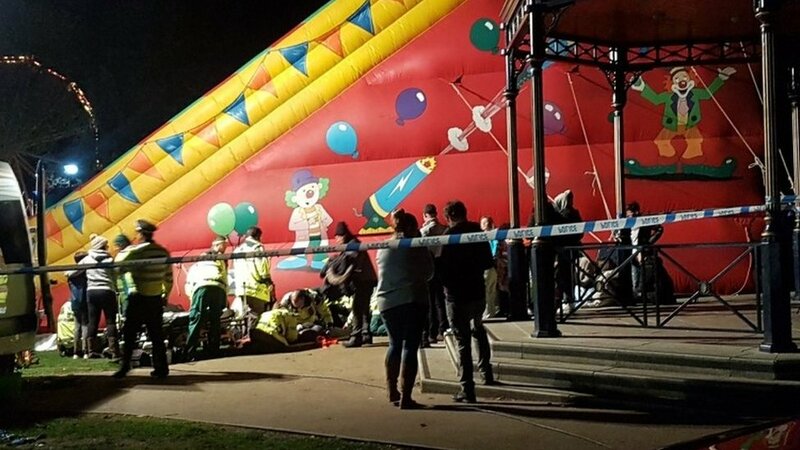 Police said a “giant inflatable slide had collapsed” and the ambulance service said it had “multiple crews” at the scene. The ambulance service has treated seven children for “potentially serious injuries” and they are being taken to major trauma centres in London. The fireworks display has been abandoned and people have been told to return home. Local musician Anna Neale said she had planned to take her daughters, aged 10 and six, on the giant slide after the fireworks, which had been due to start at 20:00 GMT. “We saw all the blue lights and saw the air ambulance arriving. We all evacuated very calmly. Everyone was just shocked,” the 36-year-old said. The incident was initially reported as the collapse of a helter skelter. Event organisers Woking District Rotary Club tweeted: “We are all very shocked and distressed by events in the funfair this evening. “Our thoughts are with the children and their families at the moment,” it added. It said the “air ambulance had left the park with the last casualties” and police have launched an investigation. Woking Park has been closed to the public and the car park has been shut to all vehicles, police said. The 23-year-old, from Guildford, Surrey, said he saw up to 40 children playing on the attraction. He said he watched the fireworks with friends before seeing “flashing lights”. A Polar Vortex Is Here Again. Yes, It’s Connected To Global Warming.